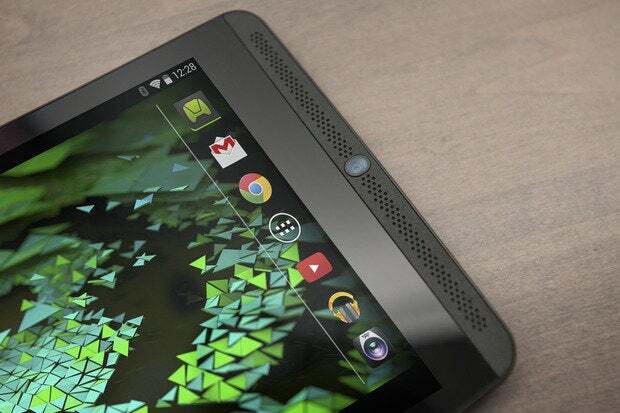 Nvidia’s Shield Tablet is not the best Android tablet you can get. It’s far and away the fastest, and it’s well-made, with a host of really great features for entertainment enthusiasts. All for just $300! But abbreviated battery life, a lackluster display, and considerable heft keep us from proudly proclaiming it the king off all Android tablets. It will have to settle for the “Best for Gamers” crown. 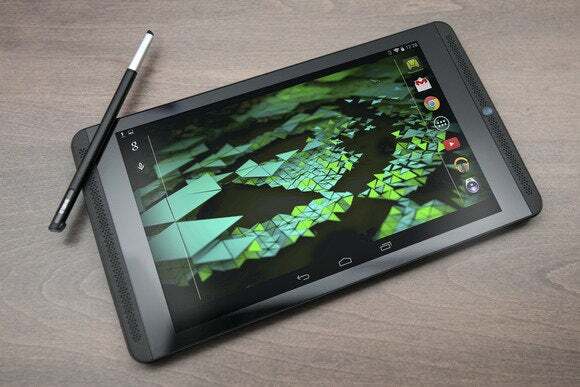 The Shield Tablet is the third self-branded product from Nvidia, following the handheld Shield Console and the Tegra Note 7. It’s made to be a showcase for the company’s new Tegra K1 chip, which marries four high-power 2.2GHz ARM Cortex 15 CPUs with one low-power battery-saver core. The chip is dominated by a massive GPU featuring 192 cores of Nvidia’s “Kepler” architecture, the same as you’ll find in the GeForce 700 series PC graphics cards. A future version of the K1 swaps out the 4+1 CPU layout with a new 64-bit CPU of Nvidia’s own design (code named “Denver”); unfortunately, this is not that version of the chip. The hardware is rounded out with 2GB of RAM, 16GB of flash storage, fast 2x2 MIMO Wi-Fi supporting 802.11n (but not 802.11ac), and a capacitive stylus that utilizes Nvidia’s own “DirectStylus” software. A 32GB version with LTE is coming this fall for $100 more. 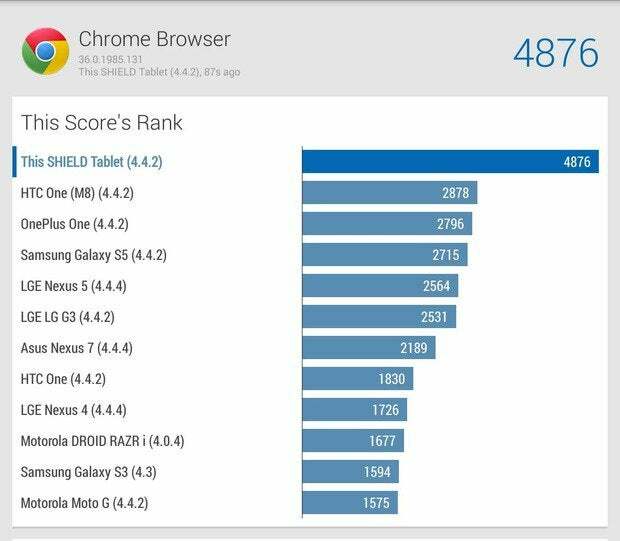 The Shield Tablet’s performance is out of this world. Check out that Vellamo browser score! You want benchmark numbers? This thing turned in a score of 4876 in the Vellamo Chrome benchmark and 2504 in the Vellamo multi-core benchmark. The GeekBench multi-core score is 3539, the single-core score is 1112. 3DMark’s Ice Storm Unlimited test produced a score of 30,522. That is not a typo—it’s really that fast. CPU performance edges out the best ARM-based Android tablets we’ve seen, and graphics performance is literally two to three times as fast. You have to buy a tablet with an Intel Core i5 processor to get this kind of graphics muscle. More importantly, everything feels fast. No matter what you’re doing, the tablet responds with the instant fluidity you’d expect from a super-fast tablet. Big apps like games load quickly and run more smoothly than on any other Android tablet I’ve used. You want a fast Android tablet? You want the Shield. Over 30,000 in 3DMark Ice Storm Unlimited is just crazy fast. If only the battery lasted longer! In our HD video playback test, it lasted a mere 5 hours 38 minutes (with brightness set to 200 nits, airplane mode enabled). The battery drained faster than I would have expected when in sleep mode, dying after just a couple days, while other tablets can go a week or more in standby. During everyday activities like web browsing, Twitter, or email, the Shield seemed to last around 6 hours. When playing games, Nvidia claims it should last “about as long” as the handheld Shield Console. That wasn’t my experience at all. High-end 3D games, the kind prominently promoted by Nvidia, will kill this tablet in 2-3 hours, not the 4+ hours you get on the Shield handheld. Yes, this tablet has a crazy-fast processor and runs like a dream, but that performance comes at a price. When cranked up to these speeds, the Tegra K1 is obviously a power hog, so you won’t be able to fulfill your dream of gaming the whole way through a 5-hour flight. There are custom power modes that let you limit framerate and turn off cores to squeeze more life out of the battery, but the fact that this feature even exists is an indication that the chip just uses too much power. Wherever you go, bring your charger. This is a handsome tablet, with a simple understated design of black and dark greys that disappears into the background, allowing content to shine through. You’ll want to spend $40 on the optional cover, which is fantastic. It snaps tightly to one side of the tablet with integrated magnets. 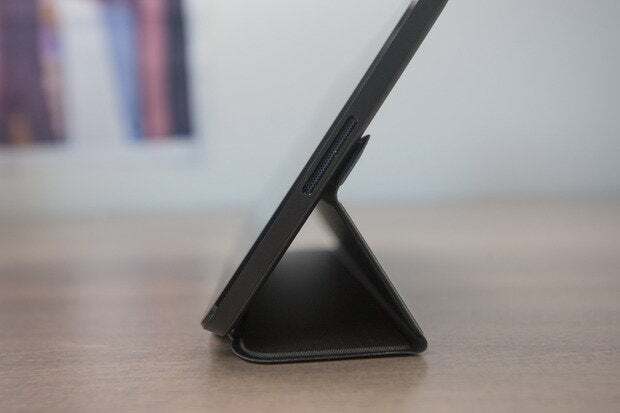 Magnets are also placed in several positions on the back of the tablet, allowing you to fold the cover in different ways to prop the tablet up at different angles. And of course, it does the “wake the tablet when you open the cover” trick. There are so many magnets on this thing, we successfully stuck it to a refrigerator door. The magnetic cover attaches to the back in several positions, holding the tablet at just the right angle. A pair of stereo speakers sit on each side of the display, pumping out pretty serious sound. No, it won’t make you replace your Jambox, but it’s a big step up from what you get with most tablets. The positioning is great for games or streaming video, and it’s loud enough to watch a movie enjoyably without breaking out your headphones. The display is surrounded by a pair of stereo speakers that put most other tablets to shame. Unfortunately, cramming everything into the Shield Tablet, including a power-hungry Tegra K1 chip and 19.75 watt-hour battery, has made for a decidedly thick and heavy 8-inch tablet. It’s 9.6mm thick and weighs 13.07 ounces. By comparison, the 8.4 inch Galaxy Tab S is only 6.6mm thick and 10.3 ounces. It’s thicker and heavier than the Nexus 7, the iPad mini, and most of the rest of its competitors in the sub-9-inch tablet category. It’s a good-looking tablet, but a little thick and heavy compared to its contemporaries. One-handed operation, whether reading books or comics or playing mobile games made for a vertical orientation, grows tiresome rather quickly. You’ll want to prop up the tablet for extended use, which isn’t the experience I expect from tablets of this size. This is billed as a tablet for gamers, and though there aren’t a lot of “gaming tablets” to compare it to, it certainly fits the bill. Android games run flawlessly and look fantastic. Special Tegra-optimized games are the prettiest we’ve seen on the platform. Nvidia was wise to bundle a specially optimized version of Trine 2—it really shows off what the K1 is capable of. 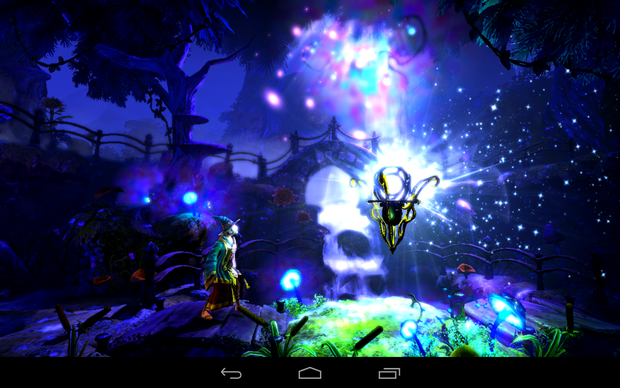 The Sheild-optimized version of Trine 2 is one of the prettiest Android games we’ve ever laid eyes on. But if all it did was play Android games really well, we wouldn’t be impressed. It’s the GameStream functionality that really sets the Shield apart. If you have a late-model Nvidia graphics card in your PC and a good modern router for your home network, you can stream hundreds of PC games to your tablet. Use a Bluetooth mouse and keyboard or just tap around on the screen to imitate a mouse. Bummed that Hearthstone is not out on Android yet? Just stream it from your PC to your Shield Tablet. GameStream resolution is limited to 720p at 60 frames per second, unless you find a micro USB ethernet adapter and plug the Shield into a wired network, which boosts resolution up to 1080p. It works incredibly well, with remarkably low latency and surprisingly few artifacts, assuming your local network connection is good. Plug your Shield into your TV via the mini-HDMI port and you can play your PC games on the big screen in your living room with minimal fuss. Or, watch Netflix in 1080p (a rarity for Android tablets). But let’s face it, you probably already have a box connected to your TV that can do that. It’s just a shame that, no matter how good your wireless network is, you can’t do 1080p/60 PC game streaming unless you find a way to awkwardly plug your tablet into a wired network. There are 5 megapixel cameras on both the front and back of the tablet and they’re…adequate. You’re not going to take amazing photos with them, but the rear camera is good enough for augmented reality apps and the front camera takes nice wide-angle video for chat and the use with the Shield’s best trick: integrated Twitch streaming. 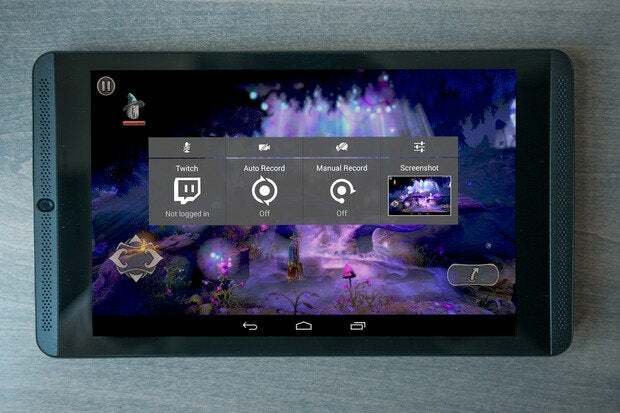 Tightly integrated Twitch streaming and game recording may be the Shield Tablet’s killer feature. In a stunning display of actually useful Android software modification, the Shield Tablet can record video of your gameplay (or almost any app you’re using) or stream it to Twitch, live. Just drag down the quick settings shade in the upper right, choose the Share option, and a menu pops up displaying the your options: Twitch streaming, record a video, or automatically buffer the last few minutes of your gameplay, continually. It works with Android games and apps, and with PC games streamed to the Shield via GameStream. There just enough options to be useful without overwhelming you. You get a few quality settings and the ability to adjust overlays for the front-facing camera and Twitch comments. It works wonderfully well, and doesn’t seem to have much of an impact on the Tablet’s performance. This is the kind of brilliant, effortless feature that makes Nvidia’s new tablet a no-brainer for game fans. Nvidia takes what we like to think is the right approach to Android customization. For the most part, the Shield runs stock Android 4.4.3. There are a few tweaks here and there, like a battery indicator in the status bar for the Shield controller and the aforementioned game recording and streaming integration. Nvidia sticks most of their own stuff into the Shield Hub, a new name for what used to the Tegra Zone. It’s a storefront for Tegra-optimized and gamepad-supporting games (but don’t worry, it pushes purchases off to the Google Play store, it’s not a separate market so much as a curated list). It also displays all the games on your device and titles you can stream from a PC on the local network. 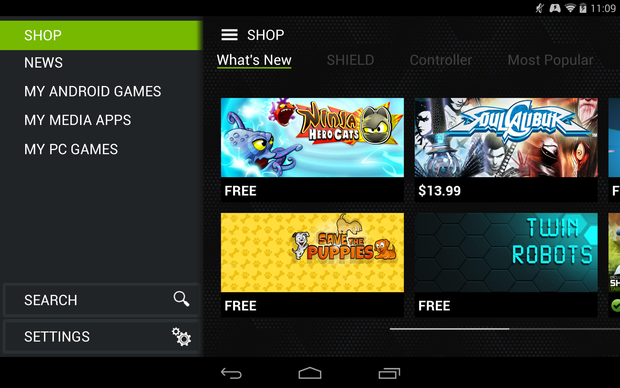 Instead of dramatically customizing Android, Nvidia offers a Shield Hub app. That’s the way to do it. It’s just an app, and doesn’t get in the way of the native Android experience. Nvidia also bundles Adobe Reader, Camera Awesome, JusWrite, the standard Twitch client (to watch streams), Evernote, a special optimized version of the excellent Trine 2, and its own Dabbler drawing and painting app. There’s nothing on the tablet you feel like you have to disable or delete. Nvidia has also included the ability to move apps (if they support it) to the SD card, an feature removed from Android since KitKat. You’ll need it, too: 16GB isn’t a lot of space for large games and videos, so you’ll want to invest in a decent micro SD card. With the Shield portable console, Nvidia demonstrated a commitment to providing very rapid updates to the latest Android releases and improvements to its own software. 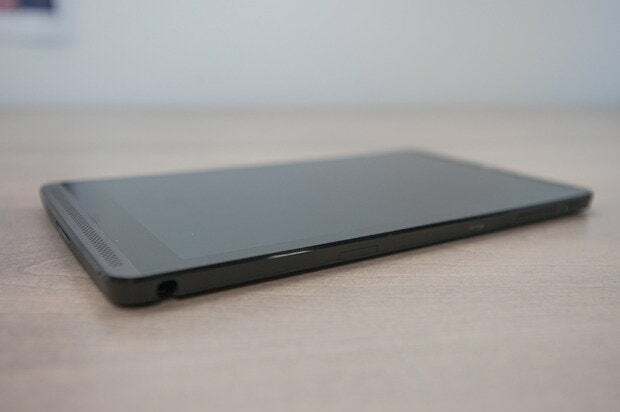 It plans to release Android L on the Shield Tablet as soon as Google makes it available; this should be one of the first devices to be upgraded to the new OS. The capacitive stylus is fine for doodles and digrams, but it’s no match for a real, pressure-sensitive pen digitizer. It sort of works. The pen is similar to drawing on the screen with a very small, accurate fingertip. 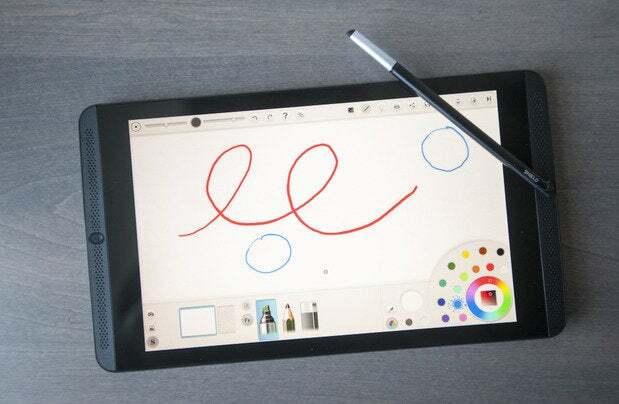 It’s faster and more accurate than that in the Tegra Note 7, but a far cry from the accuracy and speed of a real pen digitizer like you find in a Wacom tablet or Microsoft’s Surface Pro. It’s not pressure sensitive, either. You can take notes with it, and draw doodles and diagrams easily enough. Handwriting recognition works just fine. But if you’re a real artist used to a real pressure-sensitive pen digitizer, you’ll be sorely disappointed. Still, a lot of tablets of this size and price range don’t even include a stylus, so that’s a point for Nvidia. Its custom-made Dabbler app uses GPU acceleration to model light and surface interaction of various drawing implements, and it’s a lot of fun to play with, but there’s only so much you can do with a capacitive stylus.